Breathing is vital to life—but what is the ideal amount of air to breathe? In fact, the classic instruction to “take a deep breath” and fill the lungs with air is entirely the wrong approach if your goal is to deliver more oxygen throughout the body. Medicine has for decades embraced the importance for many people to eat less for good health. The next health revolution is to breathe less! 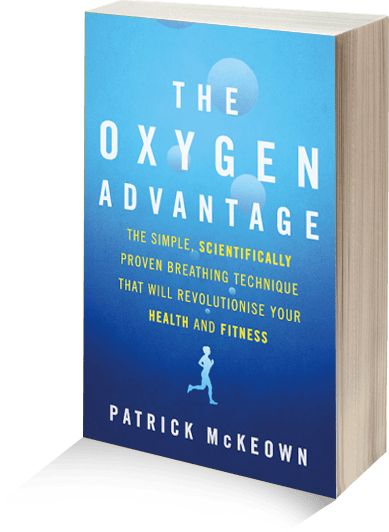 The Oxygen Advantage by Patrick McKeown aims to show you how. THE OXYGEN ADVANTAGE (William Morrow, Hardcover, on-sale September 15, 2015, ISBN: 9780062349453, $26.99) is a simple yet revolutionary approach to increasing body oxygenation for improved health. We can breathe two to three times more air than required without even knowing it (mouth breathing is a big culprit), and chronic over-breathing, a rarely identified problem, leads to loss of health and poor fitness and contributes to problems such as anxiety, asthma, fatigue, insomnia, heart problems, and even obesity. Patrick McKeown—the internationally renowned founder of the Oxygen Advantage program—explains the fundamental relationship between oxygen and the body. Improving fitness depends on enhancing the release of oxygen to your working muscles. Increased oxygenation is not only healthier, it also enables greater exercise intensity with reduced breathlessness. Accessible and down-to-earth with illustrations and a quick reference guide to facilitate understanding and application, THE OXYGEN ADVANTAGE can be applied to people at every stage of life, from children to the elderly, from overweight people to elite athletes. Patrick McKeown has helped thousands of people to substantially improve their sports performance and overall health by incorporating simple, medically proven principles and exercises into their lives. As a child, Patrick faced his own medical issues with asthma which became progressively worse into his teens and early twenties. In 1997, after graduating from Trinity College in Dublin, Patrick discovered the work of Dr. Konstantin Buteyko. He applied Dr. Buteyko’s breathing methods and quickly found that his asthma symptoms completely reversed, allowing him far better control over his breathing, with absolutely no need for medication. In addition to running workshops throughout his native Ireland, each year he gives workshops in North America, Europe, and Australia on the benefits of reduced breathing. Patrick is considered one of the world’s leading authorities on Buteyko breathing. His new book The Oxygen Advantage is the result of 4 years of research in the field of improving Sports Performance. “What Patrick and his team have been able to accomplish with their research and practice is astounding. They have introduced certain types of exercises that call for you to hold your breath while walking, jogging and sometimes running. Like running wasn’t hard enough already. Essentially, they’ve figured out a way to improve your oxygen carrying capacity and deliver more oxygen to your organs and muscles. Another goal is to train the body to reduce lactic acid build up, thereby delaying the onset of fatigue”. Patrick Feeney, Jade Barber, Chris Giesting. USA Track and Field Athletes that Patrick is currently training. “Oxygen is the forgotten nutrient and you can have too much and too little. Many more health problems than most ealize result because of it. This book provides a vital missing piece in the health equation”. “Many know that I am a major fan of using simple, inexpensive lifestyle changes to avoid expensive and dangerous medications and surgery. The Oxygen Advantage, which is an extension of Patrick McKeown’s work as a Buteyko coach, is one strategy that I believe should be included in your health habit arsenal. There simply are no downsides that I can identify and there are massive upsides. I use it personally, and would strongly encourage you to apply it to your life so you can reap the rewards”. “Patrick’s book, The Oxygen Advantage is a god send for anyone wishing to improve their performance in a way that doesn’t involve hours of strenuous workouts, drills, and endless miles of running. I’ve been doing nose breathing for the past ten years and it has totally revolutionized my running and seriously dropped my effort levels… at every speed! It’s simple to incorporate into your training and your daily life and the results are astounding. I now recommend it in all of my running classes and training programs. Every runner or athlete should have this book. If you’re not breathing right, you’re working too hard”. “The materials and concepts Patrick McKeown brings us in ‘The Oxygen Advantage’ are consistent with currently accepted western medical physiologic theories and, surprisingly, correlate well with the philosophies of many eastern sciences. Please remember that not everyone breathes in the same way, but only those who breathe in the right way will gain the best benefits from their physical exercise”. Charles Edward G. Florendo, M.D. “Patrick McKeown, breathing trainer and author of The Oxygen Advantage, recommends breathing through your nose…It’ll feel weird, but within a few weeks, you’ll notice you can exercise longer and don’t tire as quickly”. “McKeown introduces readers to the “Oxygen Advantage,” an innovative but complex breathing technique that purportedly improves overall health… McKeown’s confident attitude should help his book appeal to a wide audience”. “For any athlete, oxygen is king. Despite this the role of breathing is seldom considered. The Oxygen Advantage is about breathing to improve oxygen uptake, along with specific breath holding techniques to simulate high altitude training. Having a higher aerobic and anaerobic capacity enables us to do more with less, to exercise faster and further with each breath”. “Since attending Patrick McKeown’s workshop, I have integrated nasal and reduced breathing into my daily life, as well as into my training schedule. I now find that after intensive bursts of physical activity, either a training drill or a round in a fight, it is so much easier to re-gain control of my breathing. Oxygen Advantage helps me to calm my breathing down very quickly, by focusing on my breath in the way Patrick taught me to and of course, by keeping my mouth closed. I now feel an increased confidence in my physical ability, which in turn helps my mental endurance during competitive bouts”. “I didn’t ealize the detrimental effect of breathing through the mouth during rest and the importance of nasal breathing. Breathing too much actually reduces the amount of oxygen delivered throughout the body. This runs counter to the prevailing belief in sport but is based on medical physiology. We learn about the role oxygen plays in the body but not how oxygen is delivered from the red bloods cells and that is the important part to understand. Patrick McKeown’s book does just that, including exercises to simulate high altitude training to condition the body to do more with less. Implementing these exercises results in improved health and in turn better sports performance”.